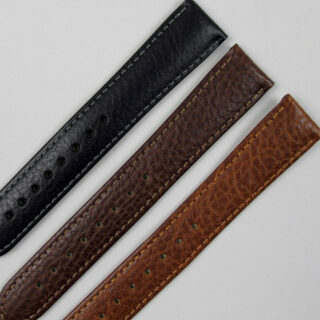 These high quality fully stitched Tuscan leather watch straps are produced and finished using an age-old process. The upper leather is tanned traditionally using pure vegetable lye and barrel dyed down to the fibre. The characteristic two-tone effect is achieved by applying the darker colour shade to the raised areas of the leather in a hand finishing process. 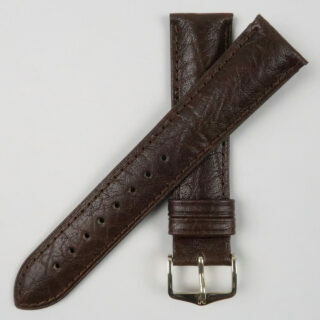 The strap is given its very attractive sheen in a final manual process performed by an experienced master tanner. These straps work particularly well with dress watches and we have found that they pair really well with vintage Rolex Oyster models. Hirsch are recognised throughout the watch industry for the superior quality of their wristwatch straps. Buckles are available in either yellow gold plated or steel. All buckles are nickel free.